Abstract: The objective was to explore the use of MRI to increase the efficacy and safeness of adjusting the cervical spine in the presence of a disc herniation when there is no evidence of cord compression on MRI. Introduction: A 30 year old male patient presented to the office on 1/8/14 with injuries from a motor vehicle accident. The motor vehicle accident had occurred 3 weeks prior to his first visit. The patient was the restrained front seat passenger. The car he was travelling in struck another car and the patient’s car was flipped over onto its roof. While the car remained on its roof the patient was able to crawl out and awaited medical attention. The patient was taken by ambulance to the hospital where he was examined and testing was ordered. The patient had multiple CT scans of the head and X-rays of the cervical and lumbar. The CT of the head revealed a nasal fracture and the patient underwent immediate surgery to repair his broken nose. The patient presented three weeks post-accident with persistent and progressive daily occipital headaches, neck pain into the shoulders bilaterally, upper back pain and lower back pain that radiates into the legs and down into the feet bilaterally. He has swelling at the left anterior knee and bandages around the right elbow and two black eyes. The patient states that he was having difficulty with regular activities of daily living including walking for more than 15-20 minutes, long periods of standing, more than an hour of sitting, any bending or lifting and any regular daily chores. The patient also states he was having difficulty getting a restful night’s sleep due to the pain. The patient’s visual analog scale rating was 10 out of 10. History: The patient denied any prior history of neck or back pain. No reported prior injuries or traumas. The orthopedic testing revealed the following positive orthopedic tests in the cervical spine: Valsalva’s indicating the presence of a disc at L4-S1 and the lower cervical region, foraminal compression indicating radicular pain in the lower cervical region, Jackson’s compression , shoulder depressor and cervical distraction all indicating pain in the lower cervical region. The lumbar testing revealed a positive Soto-Hall with pain at the L4-S1 level, Kemps positive with pain from L4-S1, Straight Leg raiser with pain at 60 degrees, Milgram’s with pain at the L5-S1 level, Lewin’s with pain at L5-S1, and Nachlas eliciting pain in the L5-S1 region. The chiropractic motion palpation and static palpation exam revealed findings at C 1,2 , 5, 6, 7 and T 2,3,4,9, 10 and L 3,4,5 as well as the sacrum. The hospital had cervical x-rays and a CT of the head on the day of the accident. Thoracic and lumbar studies were needed as a result of the positive testing and the patients history and complaints The x-ray studies revealed a reversed cervical curve and misalignment of the C1,2,5,6,7 and the lumbar studies revealed a mild IVF encroachment at L5-S1 with rotations at L3,4,5. The results of the exam were reviewed. The patient’s positive orthopedic testing, neurological deficits coupled with the decreased range of motion and positive chiropractic motion and static palpation indicated the necessity to order both cervicaland lumbar MRI’s4. The MRI images were personally reviewed. 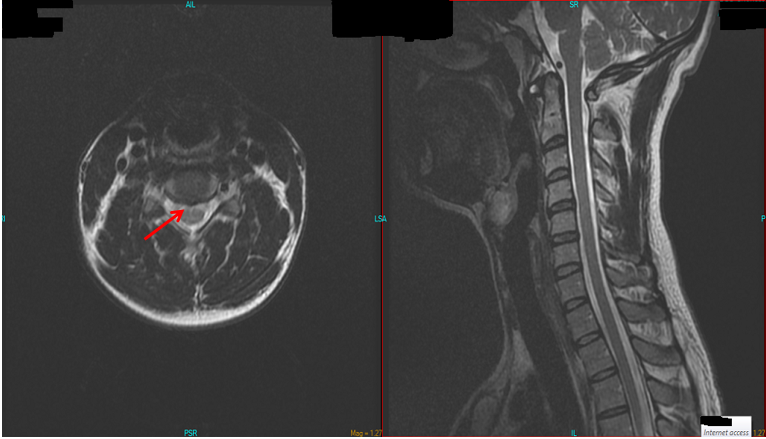 The cervical MRI revealed a right paracentral disc herniation at the level of C5-6 with impingement on the anterior thecal sac. 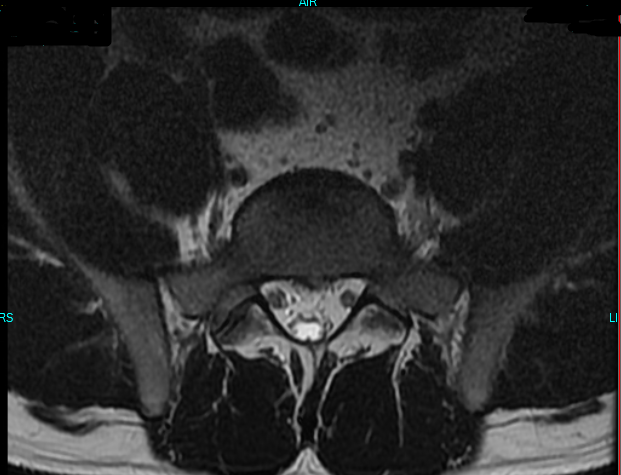 There is also a C6-7 disc bulge impinging on the anterior thecal sac. 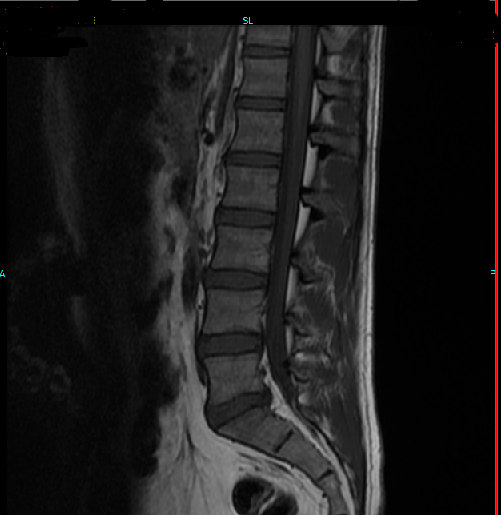 The lumbar MRI revealed an L5-S1 disc herniation. There are disc bulges at from L2-L4. The patient had decreased spasm, decreased pain, increased ability to perform ADL’s and his sleep had returned to normal. The patient states that he was no longer having the same difficulties with regular activities of daily living. He was now able to walk for 45 minutes to 1 hour before the lower back pain flared up, he is able to stand for 1-2 hours before the lower back pain begins, he is able to sit for an hour or more before the lower back pain flares up. When the patient bends or lifts he has learned to use his core and lifts less than 20-30 pounds to avoid exacerbating his low back. The patient also states he was no longer having difficulty getting a restful night’s sleep. The patient’s visual analog scale rating was 3 out of 10. The patient presented 3 weeks post trauma with cervical and lumbar pain as well as headaches. The symptoms were progressing and the pain was radiating into the upper and lower extremities. The history and exam indicated the presence of a herniated disc in the lower lumbar and cervical region. Cervical and lumbar MRI’s were ordered to identify the presence of the herniated disc as well as to determine whether or not the patient should be adjusted. The MRI results of both the cervical and lumbar MRI revealed herniated discs, however, because these discs were not causing cord compression it was safe to adjust the cervical and lumbar spine5.